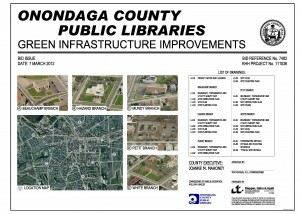 The White Library project was part of the Onondaga County Public Libraries (OCPL) “Green Library Initiative,” a partnership between the Save the Rain program and OCPL to capture stormwater while providing aesthetic benefits to the libraries. 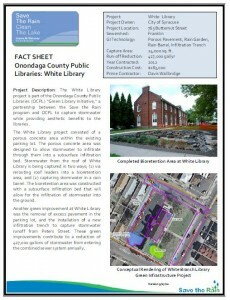 The White Library project consisted of a porous concrete area within the existing parking lot. 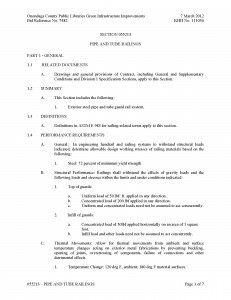 The porous concrete area is designed to allow stormwater to infiltrate through them into a subsurface infiltration bed. 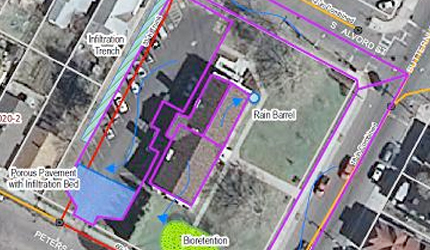 Stormwater from the roof of White Library is captured in two ways; (1) via rerouting roof leaders into a bioretention area, and (2) capturing stormwater in a rain barrel. The bioretention area was constructed with a subsurface infiltration bed that allows for the infiltration of stormwater into the ground. Excess pavement was also removed in the parking lot, and a new infiltration trench was installed to capture stormwater runoff from Peters Street. These green improvements contribute to a reduction of 424,000 gallons of stormwater from entering the combined sewer system annually.